After much research (and several months of trying to convince Iggy), I finally bought the double stroller for our babies... I'm so excited, not only because I got the one I REALLY wanted, but also because it was such a good deal. I ended up paying $549.99 including the doubles kit and the shipping costs (compared to $700, which was the price at our local baby shop).. I bought it from a website called www.BabyBecause.com, that was having a sale on this particular model. Yay for our new stroller!!! 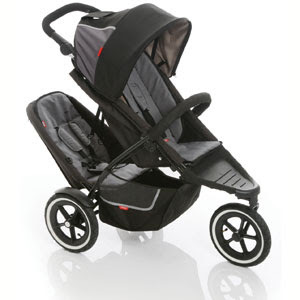 Here's a picture of it... it's called the Phil & Ted's Dash double stroller... isn't it great??? We got the Baby Trend Sit and Stand because I thought it was such a good idea that the toddler could sit or stand (LOL) but really, it's just bulky and a pain. I wish I would have gotten one like yours! YAY! I am sure you will love it! I love ours and its the basic sport one.